This is a much belated posting (it's been so busy here!!) 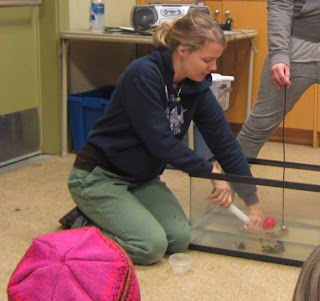 but one I felt was still important to do; every year we offer Free Science Classes to schools on the Northern Olympic Peninsula. 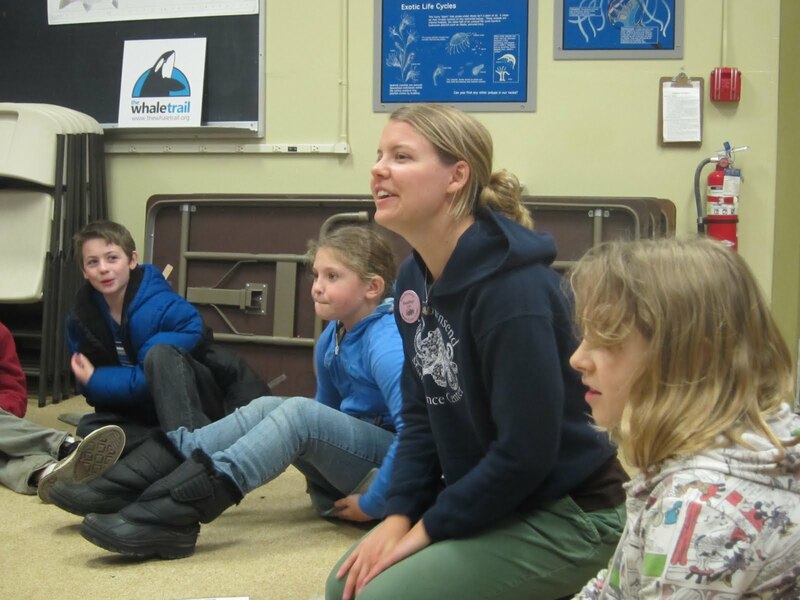 Through funding from donors (see below for specifics) we're not only able to offer these classes free of charge but we're also able to provide busing stipends to mitigate the schools' costs of traveling to the Marine Science Center. This is an excellent opportunity for 3rd and 4th grade students to visit PTMSC and take classes that expand their knowledge about local marine organisms and ecosystems while making science fun and accessible. We tailor the lesson plans to Washington State grade level learning requirements (aiming to enrich topics they're already discussing in school). This year 658 students and chaperones from 25 separate classrooms were able to attend. A follow-up survey of the teachers yielded comments comfirming that we were reaching the students in the ways we hoped; the students were engaged, they enjoyed experiencing real scientific research and they left with enhanced enthusiasm for studying and preserving the natural world. As educators, those are truly wonderful things to hear. The intent of this class was to introduce students to the science behind studying sound underwater while also discussing how orcas use sound to communicate. We begin by covering the basics of WHAT sound is (using visual demonstrations to show that it's not a wave like we normally picture but instead is a vibration). We then have the students play a game to become the compression wave; passing a "vibration" around the circle either as slowly or quickly as possible. We follow this game with a discussion of what makes sound in the ocean; students brainstorm about all the living and non-living things that produce sound underwater. They then get the chance to listen to recordings of many of these; shrimp, fish, harbor seals, cargo ships, a zodiac boat and OF COURSE; Resident and Transient calls. So how do we know all of this? How were these recordings captured? Time for the hydrophone's entrance! 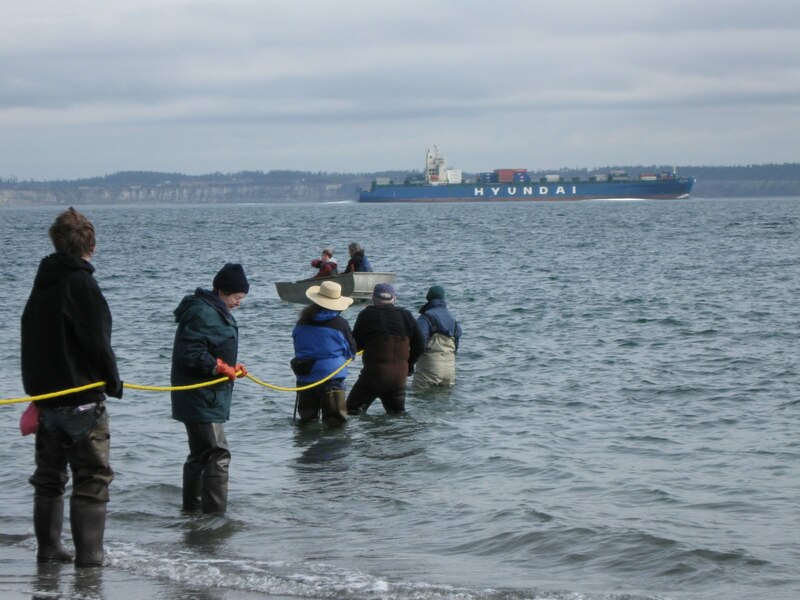 Here at PTMSC we're fortunate enough to have two hand-held hydrophones available for educational demonstrations, (this is is addition to our permanent hydrophone that is a part of the Salish Sea Hydrophone Network: http://www.orcasound.net/pt/). We use one of these portable hydrophones in conjunction with a glass aquarium filled with water to demonstrate how they function as underwater microphones. Next is a game where students sing out a "signature orca call"; aiming to find the other members of their pod amid the ruckus of all the students calling out like orcas. We complicate the game by adding background ship noise; something killer whales have to contend with in the wild on a daily basis. Just like real orcas, the students unwittingly demonstrate the Lombard effect; lengthening their calls and raising their volume just to be heard. It's thought that this is a stressor on whales and the students certainly would agree; yelling over the ship noise certainly complicates the game's task of finding one's pod. 1. What is an orca? Here we introduce these two vocabulary terms ("inherited" refers to hereditary traits the animals are born with while "acquired" traits are learned during their lifetime). We then separate the characteristics they just listed into the two categories. 3. Resident vs. Transient Orcas: This is where students learn about the many differences between our local Resident and Transient Orcas. We briefly mention their dietary and range differences and then launch into a family tree game. During this game students are assigned specific orcas and must determine their family relationships based on their information card. The Residents have far more complicated family trees and therefore must communicate more (which is the case in the wild; but is more about their prey and less about determining who their siblings are) while the Transients' family relationships are frequently unknown and their groups much smaller. We conclude with a discussion of further differences between Residents and Transients (range and amount/type of communication is largely dictated by their prey choice). Since we do have the fantastic resource of the Salish Sea Hydrophone Network we are able to play orca calls that were recorded here at PTMSC and vividly demonstrate the differences between the resident pod's signature calls (while also teaching about how vocalizations are produced by the animals). We conclude by categorizing these calls as acquired rather than inherited. All in all, it was yet another year of excellent Free Science Classes. We're not shying away from presenting real research but we're doing in an accessible, interactive way. I'm glad to be a part of an organization that puts significant effort into reaching students that otherwise would not be exposed to this type of interactive science. Hopefully we've inspired a few blossoming marine scientists! Thank you for partnering with us in helping to conserve our marine environment. Thank you for believing in and support our cause. Thank you for being someone to learn from and alongside. Thank you for inspiring us with your dedication to the center. Thank you for being with us through all the trials and tribulations of daily cleaning tasks. Thank you for being long-term, steadfast, and dedicated volunteers that allow our organization to function day to day, month to month, and year to year. Without you it would truly be impossible to even begin to accomplish our mission. Thank you for so frequently saying or doing what exactly we need at the exact right moment (even if you don't realize it at the time). Sometimes it's the unexpected small gestures that really make the difference in our day. Sometimes we feel like we don't say 'Thank you' enough but this is us trying. Spring is off to a slow start here in Port Townsend, but there are some new babies in our tanks which means it must be on the way... right? Most sea stars release sperm and eggs into the water in a process called broadcast spawning. This type of spawning can be advantagous because it doesn't require much energy for the animal (after they release the gametes into the water, their energetic contribution ends; no further care is required from the spawner). The six-rayed sea star is an exception in the sea star world. Not only is it the only species of sea star that has six rays, but instead of broadcast spawning the females keep their eggs safe from predators until they are able to fend for themselves. This practice is called brooding. Additionally, our grunt sculpin eggs have been hatching since November. The females of this species also takes great care of their eggs by protecting them from potential predators and constantly fanning the eggs with their fins. Keep checking our blog for new things or come visit us Friday-Sunday 12-4. In happens once in a while--I see a fleeting shadow trotting across the road as I am entering Fort Worden State Park, on the way to my office on the pier. Sometimes, the coyote stops and looks at me, seemingly sizing me up for moment before it turns and resumes its easy trot. Coyotes are wild, dog relatives with the ability to slyly adapt to just about any situation--earning them the nickname "trickster" in Native American myths. 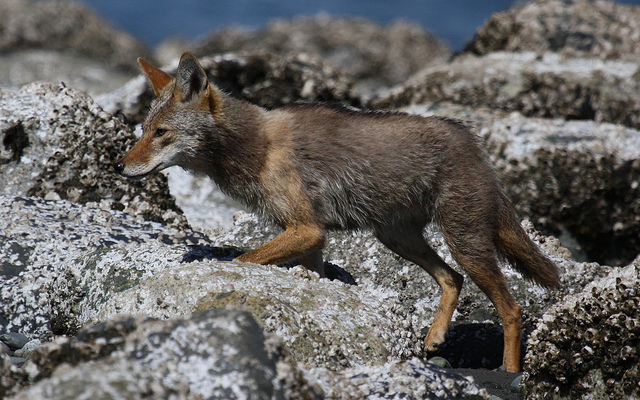 Aside from the south eastern United States and northern Canada, coyotes can be found almost anywhere in the Northern Hemisphere (including downtown urban environments). True opportunists, their diet consists of fruit, rodents and carrion. I'm also willing to bet they regularly find tasty morsels on the beach at low tide. 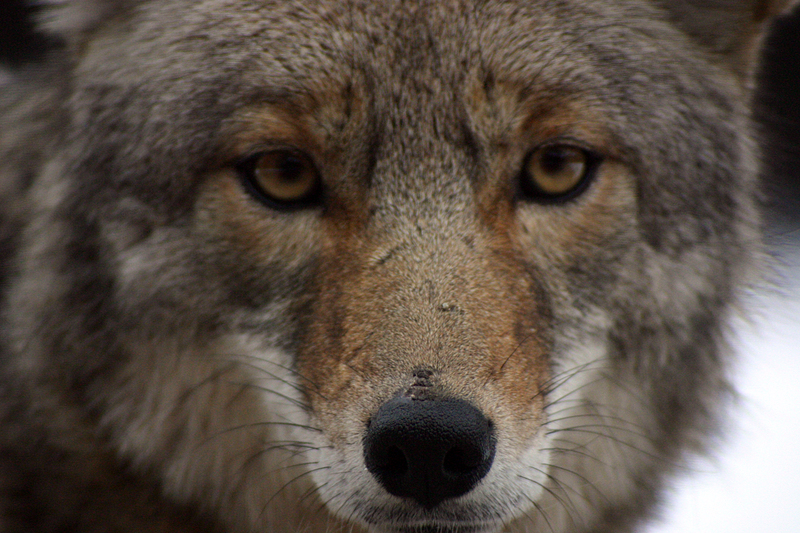 Coyotes are so adaptable that some people consider them to be pests. True to their opportunistic nature, they have been known to prey on chickens and house cats. They are also adept at scrounging through unsecured garbage or uncovered compost piles. In our area, coyote pups are born in early April through May. During this time, coyotes are protective of their young and den sites which can result in bold or aggressive behavior, especially towards dogs. You can help prevent unpleasant coyote encounters by walking your dog on a leash, not feeding wildlife, feeding dogs and cats indoors, and keeping dogs and cats indoors from dusk to dawn. I, for one, am happy to live and work in a community that can support wild animals. Follow the links below to learn more about these amazing animals and how to humans and coyotes can successfully co-exist. After being closed since Novemeber, the Marine Exhibit is finally open! On Friday, 56 intrepid visitors braved the rain to check out the newly filled tanks and animals on Opening Day. 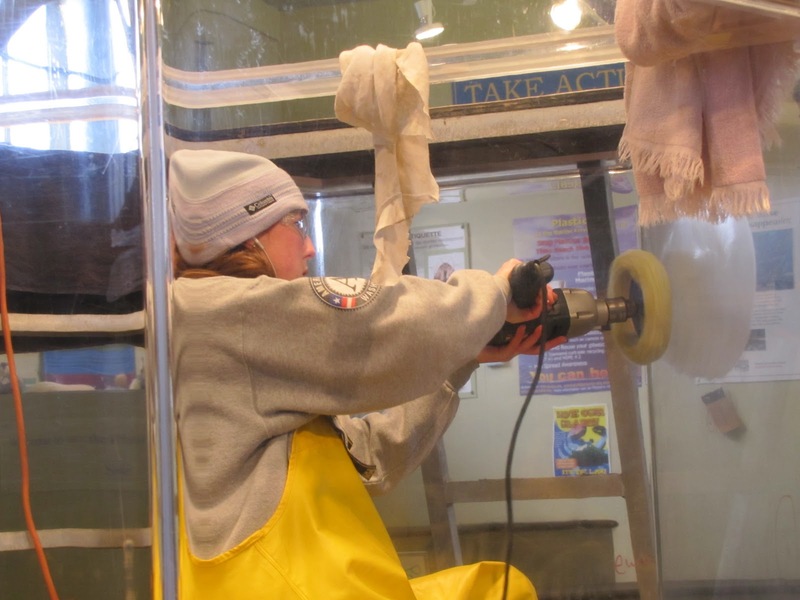 Many of the tanks were empty over the winter, but that doesn’t mean there wasn’t work to do! 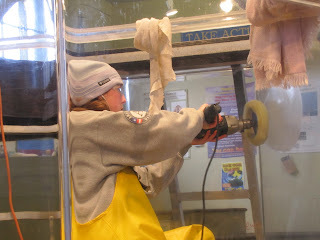 For several months, I climbed into the tanks and hand buffed all the major scratches out of the acrylic with 6 different sandpaper grits and 2 liquid grits. Buffing can be scary because as you go through the series of sandpaper, the scratch gets bigger and bigger and you feel like you're making it worse, until it finally starts to fade and then disappear. The process for each scratch is long, usually 30 minutes to an hour, depending on how deep the scratch is, how long it is and what position you have to be in to see what you're doing. You can end up in some pretty interesting positions in order to be eye level with a scratch! ﻿Designing the Piling Tank was an all-day adventure. Jess and I spent an entire day in the tank supergluing mussels onto the pilings to make an accurate representation of the habitat under the pier. This year it went much faster, thanks to the brilliant insight of The Boneman, Lee Post, who advised us to use superglue with an accelerator spray that made the glue dry more quickly. This meant less time awkwardly trying to hold a clump of mussels you couldn’t see, waiting for the glue to set.﻿ Because of this amazing glue, we were able to attach more mussels to the pilings! ﻿ Once the habitats were ready, we started adding animals. Tubesnouts, pipefish, snailfish, sculpins, shrimp, and decorator crabs are just a few of animals waiting to meet you! 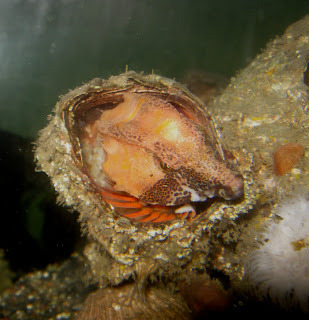 ﻿﻿Don't hide in a barnacle like this grunt sculpin! Come check out our new tanks and animals and watch as we add to our collection throughout the season! Visit us on the Fort Worden pier Friday-Sunday, 12-4pm.